BILLING, HIMACHAL PRADESH THEREâ€™S a continuous warbling in the air about 8,000 feet above sea level in a thickly forested hill. In the flurry of activityâ€”the unbuckling of rucksacks, unfurling of sophisticated plastic stuff, beeping GPS machines â€”there is hardly a sound around except of course the call of the air thermals. Welcome to Billing in Himachal Pradesh, the hot-spot for paragliders from around the world and the venue for this yearâ€™s Paragliding Pre-World Cup. Those who come here are an assorted lot. There are foreigners, city dwelling Indians and local youth who outnumber the rest. Statistically, the local youth, especially from the Kullu valley, are soaring higher than their former trainers, the foreign gliders. And the transformation has already taken an avalanche proportion if the sight at Solang Nala slope is any indication. Itâ€™s take-off time hereâ€”they call it window openingâ€”and one can see few youngsters helping Debu sort out his stuff. 23-year-old Debu Chowdhary from Vashisth village is a model figure for aspiring gliders Half-Indian half-Italian, he has been flying for the past nine years when he left studies after Class 12 for fulltime flying. Today he runs a successful paragliding agency and spends his summers flying in Europe. For a place notorious for being the cannabis kingdom, paragliding had opened up new job opportunities. Introduced to the state after 1995, today every village around the valley can boast of a good number of gliders. 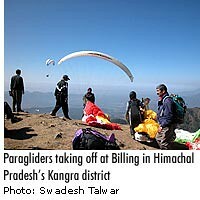 In fact, in the previous Paragliding World Cup three pilots from India took partâ€”two were from Himachal. â€˜â€˜That is because the youngsters have taken paragliding as a profession and not just recreation,â€™â€™ says Col H S Chauhan, Director, Mountaineering and Allied Sports, Manali. For someone who still sees air travel as a dream, paragliding may well be described by a psychoanalyst as a natural option. From tilling fields and working on the orchards to saddle on a hi-tech chuteâ€”the transformation is taken quite nonchalantlyâ€”a chain reaction that some say was started by Roshan Lal Thakur, who now runs the only credible paragliding training institute in Indiaâ€”the Himalayan Institute of Adventure Sports, Manali. And at the centre of the boom is Roshanâ€™s village, Burua. By his estimate there are around 125 gliders in the village, about 85 doing tandem flights that require advanced skills. Not all are present at the Pre-World Cup here because itâ€™s â€˜season timeâ€™ back home in Manali. â€˜â€˜We learnt flying from friends and relatives and thatâ€™s how almost all of us know flying,â€™â€™ says Ved Ram, a first year college student from Burua. Similar sentiments aired by Uttam Thakur, Mangat Ram, Chand Thakur, Manu Abroal… all from the same village and at different stages of learning. â€˜â€˜The boys belong to farming families and paragliding has given them an extra source of income,â€™â€™ says Roshan. A glider can cost about Rs 1 lakh which is a big amount for locals. â€˜â€˜But for the joy of flying there is no cost,â€™â€™ says Ramesh, a PCO owner from Bir who has his own equipment and is obsessed about flying. â€˜â€˜Boys can earn anything above Rs 1 lakh in a season,â€™â€™ says Debu. About 70 per cent of their clients are Indians, mostly joy-ride seekers, and the rest foreigners. â€˜â€˜We were about four instructors in the beginning in Billing, now about 20 more come visiting,â€™â€™ says Bruce Mills, the Kiwi paraglider credited with introducing the sport in India. Roshan explains the boom here saying that unlike Europe, where you need a licence to be an instructor, there is no umbrella body in India to monitor flyers. Frenchman Xavier Remond flew 132.5 km to set the out-and-return paragliding world record at Bir-Billing in 1992, and the boys swear by this figure. So when one sees the skies of Billing, Solang (Manali) and Bandla (Bilaspur) overcast with colourful paragliders in early spring and pre-winter, there is someone up there stretching himself to the limits.